Now that autumn is almost here, we’ve all noticed that the nights are getting a little longer and that the temperatures are starting to drop. Maybe you still have your air conditioning on, but that won’t last for much longer. Make sure that you’re prepared for the day when the weather shifts by making sure that you have the propane you need to be able to run your heater or furnace. At Blueox Energy in Oxford, we offer you the best prices on all of our energy products. 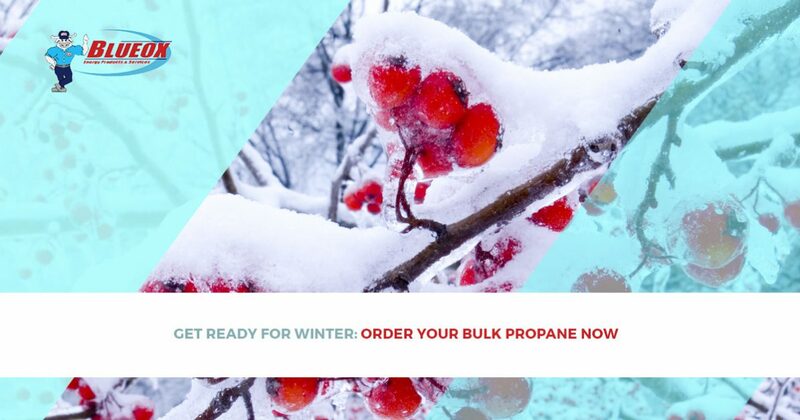 From fuel oil to kerosene to propane, we have every kind of fuel that will keep your business or home warm and comfortable during the frigid winter months. Read on to find out why you should make sure that you have the propane you need now, rather than waiting until the last second. If you want to order any of our fuels 24/7, check out our easy to use, on-demand website. While you’re there, you can get a price quote with the most up-to-date prices and schedule a delivery. If you have your tank filled before the first frost or before the first big storm, not only will your house remain nice and cozy, you’ll also save some money. Prices tend to go up as it gets colder out because more people remember that they need propane. If you fill up before you HAVE to, you’ll be happy to have some extra cash in your wallet. We see it every year: a cold front moves into the area and we get a ton of calls from people who need to have their heaters or furnaces serviced. We always do our best to get our certified HVAC techs out to help people as soon as possible, but it can sometimes take days to get to everyone. Don’t go without heat for days at a time: check your heater today to make sure it is functioning properly before you really need it. Scheduling maintenance or a repair while the weather outside is still warm will enable you to have a comfortable home when the temperatures start to drop. Our delivery drivers are highly trained to be safe and efficient. Part of every fuel oil or propane delivery includes an inspection of your tank to ensure that it is safe to add fuel or propane to. Our drivers are also trained to travel safely during any kind of weather, so you can rest easy knowing that you will receive your fuel even when the weather isn’t great. We always have the best customer service. At Blueox Energy, we have always strived to provide you the best fuel products, furnaces, air conditioners, and other home needs at the lowest possible prices and with the best customer service. We solve problems, we don’t cause them. Our new, always open, propane on-demand site makes ordering even easier for you. Contact us today if you have any questions about any of the services and fuel products that we offer at Blueox!